The Aral Sea was once a large endorheic lake between Kazachstan in the North and Uzbekistan in the South. It used to be one of the four largest lakes in the world having an area of 68,000 km². 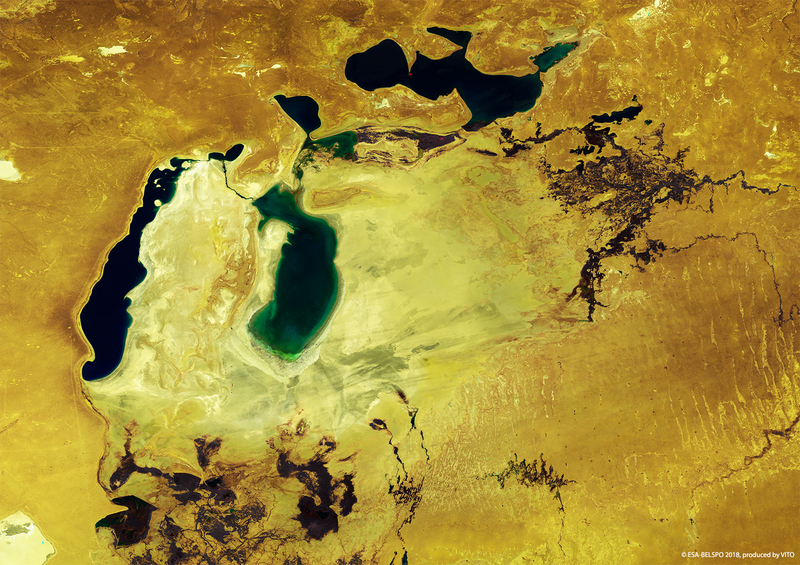 However, the Aral Sea has dramatically shrunk since the 1950s as a result of diverting the supplying rivers for former Soviet irrigation projects. By the 2000s, the lake had shrunk to about 10% of its original size and by 2014 the Southern Lake had virtually dried up. In 2005, the Kok-Aral Dam was completed to restore water levels in the Northern Lake. In addition, a sluice is periodically opened to replenish the Southern Lake. The animation of two PROBA-V images (15 April 2014 – 15 June 2018) clearly shows the gradual Southern Aral Sea increase from being nearly dry to having a substantial size again.